Few weeks ago Pakistan Tehreek Insaf (PTI) organized a Dharna against US Drone strikes in Pakistan in Peshawar now Imran Khan is organizing a Dharna in Pakistan's largest City Karachi. Imran Khan has announced to block Karachi Port as protest against American Drone attacks which have killed thousands of Civilians in Pakistani Tribal areas. Nato Supplies goes from Karachi Port which will be blocked due to Dharna. 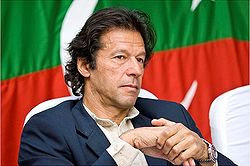 Imran Khan has asked People of Karachi to participate in the Dharna. He also demanded Pakistani rulers to take steps to stop American drone attacks.